A Racing Rock. The Racetrack is for rocks, not cars. Back in September of 2016 I visited the Racetrack and really had quite a reaction to the inconsiderate vandalism that had happened there. Some people had driven all over the playa, including in at least one spot over the tracks of racing rocks themselves. This is a unique spot on the entire planet, and driving is not allowed here. I was not prepared for that post to go viral, and I ended up being interviewed by the very kind Domenica Davis via Facebook Live on the Weather Channel’s page and my post was republished in Petapixel and reference in DPReview and other places. Here’s a few other things that have happened since then. Death Valley National Park posted on Facebook about the damage, including a traced map of some of the tracks across the entire lake bed. 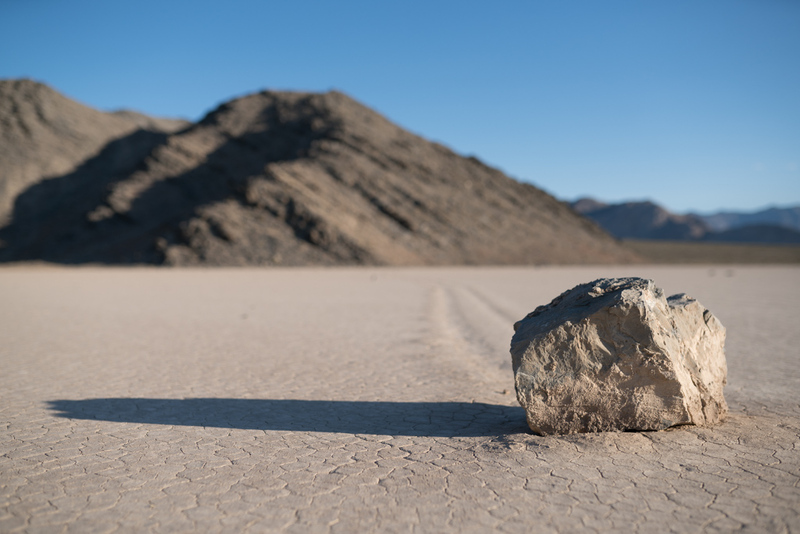 News outlets like the LA Times published articles saying “Federal investigators have identified a suspect believed responsible for a frenzy of high-speed driving across “Racetrack Playa,” a remote dry lake in Death Valley National Park” after which I have not seen any further updates. I heard a rumor that someone had laid new tracks around Christmas 2016 but I had not seen any photos or posts or articles about it. 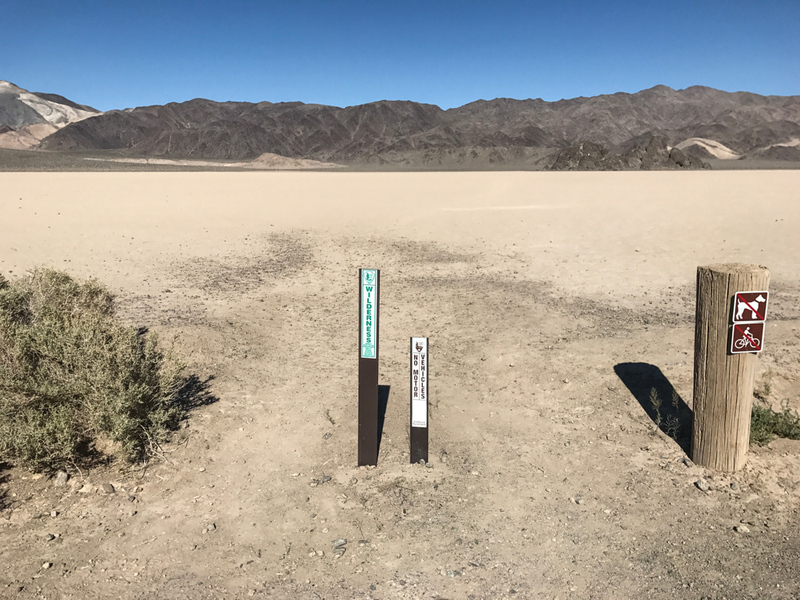 Other kinds of vandalism have happened, such as defacing of historic inscriptions, which Death Valley also posted about on Facebook. A van drove out onto the salt flats at Badwater and got stuck. This is another place where tracks can last a really long time. I visited the park three times, twice in January and once in February when Badwater flooded. Badwater when flooded is one of the most magical places I’ve ever seen, and home to the most incredible sunset I’ve so far witnessed in my lifetime. I hope to write posts about those visits at another time. A bunch of other priorities kept me from coming back to the Racetrack, however, until Memorial Day weekend. 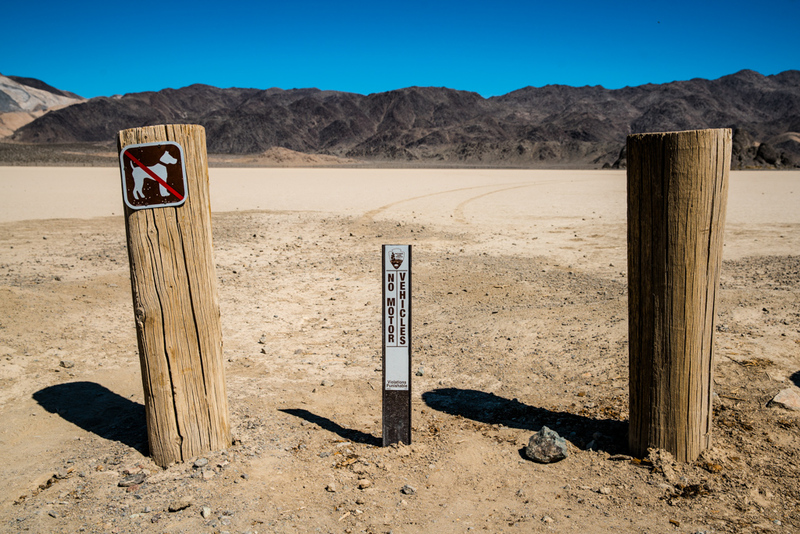 Plus, if Badwater was flooded that meant Racetrack Playa was likely flooded too, or at least wet, and you do not walk on it when it is wet. I wanted to go there with the specific purpose in mind of revisiting the damage that inspired so much anger last September and to see what the historically wet 2016-2017 winter has done to repair the damage, if at all. Armed with GPS coordinates of photos I took last fall, I went straight for the Racetrack on Saturday, May 27th. I said some words to a car full of naive visitors in Panamint Valley who were feeding coyotes (DON’T! ), and helped a family who had a minivan in need of a jump in Stovepipe Wells where it was nearly 110 degrees before finally I made the long dirt trek to one of my favorite locations in the world. Late May is already getting to be quite hot in Death Valley. I don’t like to come here when it is hot, but at least at nearly 4,000 feet elevation the Racetrack would only be in the mid 90’s. Getting to the heart of the matter, I’m going to detail five kinds of vandalism that has happened around here, starting with the most obvious. From this vantage point, we were looking good. I wondered if the NPS had done some rehabilitation of the area right next to the parking area, but all hope quickly faded away. Just a few feet away toward the Grandstand, it begins. I tried to recreate exactly the photos I took in September, but alas a few factors were at work. First, I think the GPS from my phone was not very reliable when I took many of those photos. Second, there is definitely MORE damage than I remember from then, making tracks mixed up. And third, I quickly became overwhelmed with the quantity of tracks. So the next photos are all from the damage around the Grandstand, mostly between the Grandstand and the parking area. This damage is NOT part of what the National Park Service traced on their GPS map overlay. Footprints are just as bad as car tracks! I’m glad the footprints didn’t venture far. Not all of the area around the Grandstand is currently in a ruined state, but most views to the East are polluted heavily by tracks. By my estimation, some of these tracks are new compared to my visit in September and others are the same. I wasn’t able to line up any exact photos of 1:1 damage between the two dates. However, I knew that Death Valley had posted that GPS map of some of the tracks and they were on the far east side. So I ventured out there to find those tracks as a measure of whether or not repair had happened this winter. More than 3/4 of a mile away from my car I found my answer. These next two photos are from the August 2016 joy ride that the National Park Service publicized not long after my viral blog post. These August 2016 tracks were very much not gone and judging by their depth they will be around quite awhile. Maybe years. If you think about it, it makes sense. The lake bed surface needs to soak to be vulnerable to reforming. Gentle winter rains are not going to come down with enough force to cause the sediment to stir up enough to fill in those deep vehicle grooves. Perhaps a violent summer thunderstorm could help, but it’s going to take some time before these scars heal. This is one of the driest deserts on the planet. To my astonishment after the Grandstand I found that here some of the tracks were either largely repaired or diminished, or perhaps my phone GPS logged the wrong location. That’s not to say I didn’t find tracks there. After this brief stop at the middle, I moved to the final parking area which is the one closest to the most rocks. I tried to navigate to this exact spot but I couldn’t find it despite having GPS coordinates. Where it was supposed to be there was no trail: no car trail and no rock trail. Since I took those photos with my phone, I think the GPS coordinates were possibly off quite a bit. I’m hoping it was repaired. I wondered around quite a bit and did not find any car trails that made it still into the main area of rocks. This has me yet again wondering if the NPS did some work out there to try to help repair the damage, or if nature was able to do a little healing at this end of the playa. You’ve already seen some pretty terrible footprints by the Grandstand parking area above, but there were plenty of other footprints at the south end too. DO NOT GO OUT ON THE PLAYA WHILE WET. Footprints can be just as bad as the tire tracks and last just as long, spoiling the experience for others who want to enjoy this magical place. A large cluster of footprints near the main rock parking area didn’t extend too far out but did go more than 1/4 mile out to some rocks. Whoever did this is incredibly inconsiderate. Who wants to see that? Those are going to be there awhile. Please don’t do this. Posted signs say not to walk on the playa when wet for this reason. Don’t do this. My only comfort is maybe it’s good that such inconsiderate people didn’t make it to where the rocks really are. Yes, people steal the rocks. This is a crime. Don’t move or steal rocks please. Where is the rock? It’s gone. When the rocks move, they leave trails. They only don’t leave trails when they are picked up and moved by humans. It’s heartbreaking and sad that people would do this. I’ve heard stories, and thankfully I have never witnessed anyone taking a rock myself. This photo is from 2008, so it’s not a new phenomenon, sadly. Apparently some people, before it was documented how the rocks move, thought the rocks themselves had some kind of mystical properties. The only mystical properties I hope the stolen rocks have is that they act as a curse upon the people that took them. While in the 8+ months since I first saw the massive extent of damage to this incredible unique place I reached a calm where my blood wasn’t boiling in documenting all this, but it still boils for this last one. This rock hasn’t moved since last September and there’s no word about any search for the awful people who did this. “D” and “K” should be banned from all national parks for life with this level of offense. The lake bed will heal one day. The rocks will not. These letters are chiseled into the rock, deep! Where’s the emoji for infinite rage? That’s what this makes me feel. The Racetrack right now is still heartbreaking. Maybe that’s because in the past I’ve only seen some occasional footprints here, which in the long intervals between my visits have been repaired over a timeframe of years. There is just a whole new influx of selfish visitors reaching this place in recent years I guess. I fear it will get worse. Since the news stories and articles, the National Park Service I read was exploring various ideas to improve or change the Racetrack in response to these crimes including increased ranger patrols, volunteers, re-configuring the road, erecting barriers against cars, or other ideas. I should note that the massive proposed budget cut to the National Park Service certainly won’t help. Please contact your representative and encourage them to increase rather than decrease NPS funding! We need for the NPS to have the resources they need to protect our special places. I find this valley to be absolutely spectacular though, even if the rocks were not there. So there’s definitely enjoyment to be had. If the bad people can stay away long enough and thus not cause more damage, eventually the surface of the lake will be repaired. In my head I keep going back to the magic of the first time I ever visited this place back in 2008. There were some really amazing tracks back then. Recent rock moving events have not produced such varied trails and I am ever hopeful for a really nasty and chaotic winter here so that really interesting new rock tracks can be naturally carved. It is a dynamic place but the change is slow, as evidenced by the deep trails from last summer still easily visible. If you see someone defacing this place, document and report it. Especially if it’s the special type of jerk who would chisel into one of the rocks. That’s inexcusable. This is a special place. Help protect it! One last bonus: there was one really unexpected thing I saw on this most recent trip to the Racetrack. It brought a smile to my face even. At sunrise on Sunday I went to the Grandstand for a change. And while I approached it I saw something that at first I figured was a person. But then it flew away as I got closer. It was a Great Egret. I think a very confused one. I don’t know what would lead such a water dwelling huge bird to end up at a dry playa in Death Valley National Park on the cusp of summer, but it was neat to see this magnificent creature here. As I explored it would fly away to another part of the Grandstand, keeping an eye on me. It never ceases to amuse me that such neat creatures with clear air superiority are so skittish about us gravity constrained humans. Death Valley is full of surprises, I hope when you visit you are pleasantly surprised.